Mahatma Education Society, the parent body of Mahatma School and Junior College is an institution founded on the rock foundation of the values and principles conceived, cherished and followed by the great mahatmas of our soil. Truly speaking the cardinal principles of a good and meaningful life are universally the same. Thus, Mahatma Education Society’s nomenclature is not a coincidence but a well-conceived symbolism for its ethos, values and objectives, M.E.S’s journey from a small school in a tiny shed at Chembur to a world class education complex at New Panvel, is a saga of sacrifice and struggle. The phenomenal progress of Mahatma Education Society is the outcome of the far-sighted vision of its founding father and Chairman, late Principal M. P. Pillai, the missionary zeal, global outlook, undaunted spirit and dynamic leadership of its Executive Secretary and C.E.O., Dr. K. M. Vasudevan Pillai, the enlightened guidance and inspiration of the Joint Secretary Dr. Daphne Pillai, and the unstinted co-operation and support of the staff, parents and patrons. 'Local Action and Global Option' is the motto of Dr. K. M. Vasudevan Pillai, the Chief Executive Officer of Mahatma Education Society. Under his dynamic leadership, Mahatma Education Society has taken a leap into the direction of realizing his vision and mission of enabling the younger generation of Indian Community to have an access to the latest and the best global initiatives, concepts and developments in the field of education. Transcending the boundaries of the State Board Education System, MES has set up a CBSE school from the academic year i.e. 2009-2010 as a sister institution of Mahatma School of Academics & Sports with a different nomenclature i.e. Mahatma International School (CBSE) housed in the newly build multi-storey building in sector 8, Khanda Colony and equipped with the latest amenities conducive to ideal teaching and learning activities. To be an intenationally recognized academic institution of very high repute that strives for the achievement of full human potential of every pupil who enters its portals, and commands respect and administration from pupils, alumni, teachers, parents and the community and the society at large. 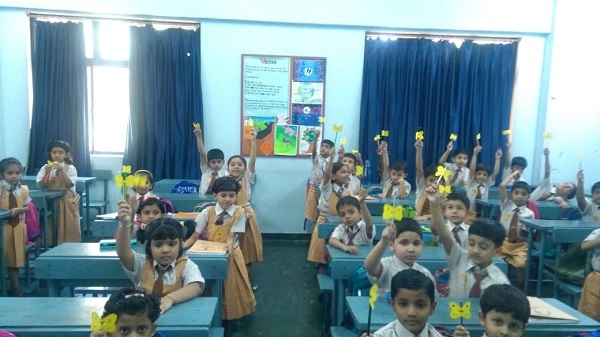 To help every pupil who enters the portals of Mahatma Education Society's Mahatma International School achieve one’s highest Potential making learning an enjoyable experience and inculcating the most desirable human qualities. To help every pupil to transform oneself from childhood to adulthood experiencing physical, mental, emotional and societal growth processes comfortably. To strive to create every year a batch of outgoing pupils who will grow up to be highly respected and accomplished citizens who are socially conscious and concerned about the community. To attract and retain the best of teachers who believe in the vision of the school and become partners in accomplishing its mission by their lives an examples, and being role models and mentors for the pupils.